Coastal vessel CARITA moving in Tilbury in the late 1960s. Registered in Chester. More details please RWJ. 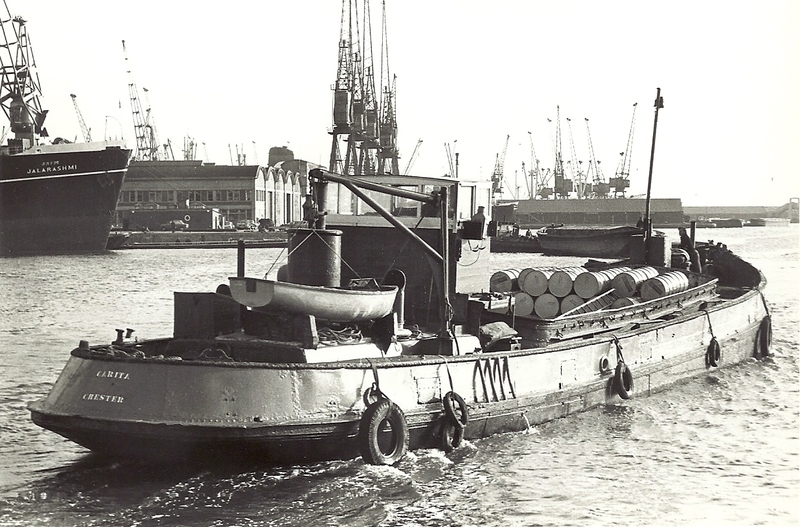 The CARITA was frequently seen on the river Thames and in some of the docks, including Tilbury, during the 1960s and ‘70s, but appears to have “dropped off the radar” since the ‘80s and the latest information I have is that it has been scrapped … which is not surprising because if still around it would be 101 years old. This 140-tons gross, 208 tons deadweight motor coaster started life in June 1913 when it was completed at a shipyard on the river Dee, near Chester, and it was to spend its first few years on the river Mersey, where its owner, John Summers & Sons, which had a steel works on the Mersey, used CARITA and about 20 other vessels to carry steel sheets, mainly to Liverpool and Birkenhead docks for onward shipment overseas. CARITA (96 ft long 21.5 ft wide) had many owners, and when this photo was taken in Tilbury dock, she was owned and skippered by Paul Banyard of Colchester, who owned it for several years. The coaster was quite expensive to maintain, and I have a note which says that the original Bolinders engine of 1913 was becoming a big liability and needed a potentially costly replacement. Sometime in the 1950s, the then owner found a second-hand Crossley 165bhp diesel that was about 15 years old, had not been used but was destined for scrap; this was purchased for scrap value, tarted up a little, installed on CARITA, and kept it going for a few more years.